I began this crazy business of writing after complaining about a book I had used in high school. Called Foods and Home Management the little red book was first compiled in 1932, and I was teaching from it! That complaint to Ministry of Education’s Bruce Naylor brought me to writing two popular foods and nutrition texts whose story will be a part of my next book. 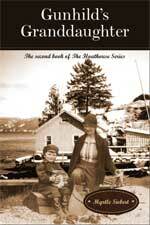 Beyond the Floathouse, Gunhild’s Granddaughter, begins a boat trip back in time to 1938, when a baby girl was born in Vancouver General Hospital. Her mother, Hazel Forberg, had travelled from Port Neville aboard the SS Chelosin at least a month before she was due to give birth, particularly since this was her first child. Our arrival home to the Port Neville dock occurred a month after my birth as the first Forberg granddaughter. We need to remind ourselves that in that remote location of the Forbergs floating hand-logging camp, there was no medical help available: no hospital, doctors, nurses or even a doula. This little book is the second of a trilogy that began with from Fjord to Floathouse, one family’s journey from the farmlands of Norway to the coast of British Columbia. Those of you who have read it will recognize the girl Rae. In this new book Rae is Myrtle Rae Forberg, now writing in first person. Many of the same locations, including Port Neville and Rock Bay, are important in this book too, of course. Port Neville was the farthest northward stop for the Union Steamship before it turned south. Those boats were our only connection to the outside world. Their schedule brought the ship north every two weeks. Mail and all supplies arrived then; including any groceries that couldn’t be picked, fished or shot. Most food came in sacks and cases and except for root vegetables, all vegetables and most fruit came canned, with no such possibility of fresh green vegetables. The first chapter of Beyond the Floathouse, Gunhild’s Granddaughter describes my welcome at Port Neville and tells about the much earlier arrivals of both sets of my immigrant grandparents. The next four chapters describe other aspects of my early life and the lives of those other residents of that remote area: school lessons from the BC Elementary Correspondence School, taught by mothers, Christmas preparations and any other important celebrations on our floathouses, sometimes with my grandparents and occasionally our extended family. Then at Chapter 6 came a huge and important life change: We moved our house – from the float where it had always been, on to a spot of land farther south along Johnston Strait to Rock Bay. Even more importantly, there was a road out, a rutted gravel logging road, but it went to somewhere! For the first time I was able to experience very small forms of independence, incremental, but nevertheless, – – I could walk all the way around our house, climb up on the rock after which Rock Bay was named, and at nine years of age I even learned to ride a bike! Readers will find that at the end of most of the chapters I have inserted a more recent thought I call Reflection. A good example is on page 78 where I explain the call that water has had on me. This move to Rock Bay also meant that for the next 4 years I got to attend a real school – we had one teacher who taught 8 grades sometimes having up to 28 pupils. We all learned cooperation and sensitivity there and a good understanding of at least one other culture. In this case 2/3 of the students were of Chinese heritage – children of the Jay brothers who came originally from Victoria. Their fathers – as Jay Brothers Logging – worked in the next bay and the camp crummy brought the children to and from school every day. The next shocking change comes at the end of Chapter 8, when I was ready to begin Grade 9. My parents made the decision, I learned much later it was an agonizing one, to send me out to Campbell River for high school. They were not yet prepared to move as a family, or to send me away to private school, so they arranged for me to board with different families for each year of high school. However, with that move, I was being trusted with the responsibility of making my own choices and I was only 13 years old! Beginning about Page 97 I’ve tried to describe the loneliness of that transition. Then during Grade 12, I suffered a huge surprise. Imagine this, I’m called on the school’s PA system to the principal’s office! There sat Mr. Fogg and Mr. Monk together with the principal, Mr. Phillipson, who asks if I ever considered going to university. “No, Not really,” I replied. The fact was I had never knowingly met anyone who had been to university. Shaken by this unexpected meeting I asked myself, Why? What more do they want to know? I remembered having an argument with my father who would never allow me to fill in the part of the school counsellor’s form where it asked for the parent’s annual income. His secretive nature about the privacy of money issues was part of the reason why I never knew if, or how much, he paid for my board so I could attend high school. “We have already completed some parts of this form,” Mr. Phillipson said. “Here they are, you just have to fill in the personal details and write a short essay about why you would like to have this scholarship to be a teacher,” he told me.